As an alternative to the classical approach for system specification on the basis of a formalised general purpose language a graphical and specialised language for application to safety critical systems is outlined. 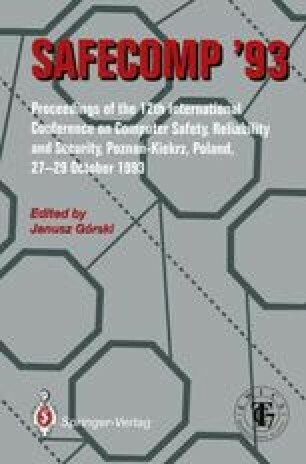 The architecture of the language is constructed in accordance with the functional and timing requirements typically for operationality in safety systems. The fundamental and generic elements of the language are presented: the syntax and semantics of function and net diagrams. A wide range of operational behaviour (functional and timing) can be determined by this graphical specification technique, several ways of specification analysis are opened. Some examples show how to benefit from the combination of illustrative graphical demonstration and strictly defined rules for their interpretation.